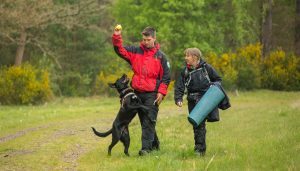 On Saturday, 6th May, three NorLSAR dogs achieved Stage 1 status in their training towards Level 2, and 1 dog achieved a Stage 3. 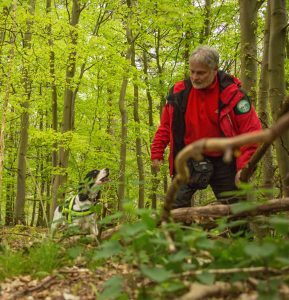 These levels are intermediary assessments on the road to becoming operational search dogs. The dogs to pass Stage 1 were Archie, a border collie; Juno, a 10 month old German Short-haired Pointer; and Nelson, an eight month old Labrador collie cross. Springer spaniel cross, Flynn, passed his Stage 3 assessment with flying colours. 8 month old Nelson being rewarded with a tennis ball after successfully finding a “missing person” in his Level 1 assessment. Flynn leading his handler, Jonathan, in to where the “missing person” was hiding.